17.5 + 7.5 x 38"; 723hp @ 110rpm by Charles Reeder & Sons, Baltimore, MD(1896). Service on James River & Chesapeake Bay; also ran Baltimore - New York City, NY. 1901, Apr 8 Owned Baltimore, Chesapeake & Atlantic Railway Co., Baltimore, MD. 1901, Jun 25 Owned Williams Transportation Co., South Haven, MI; passenger & fruit trade; overhauled Milwaukee, WI. 1902, May Chartered by Graham & Morton, Milwaukee, WI; ran Milwaukee - St. Joseph in fruit trade; also Chicago - Holland. 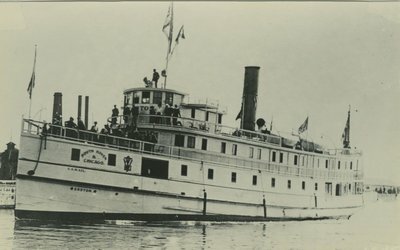 1902, Sep Grounded Muetawa Bay; ran Sault Ste. Marie - Mackinaw City. 1903, Jun 1 Owned White Line Transportation Co., Duluth, MN; W.H. Singer, President; ran Duluth - north shore points on Lake Superior; later merged with Booth's U.S. & Dominion Transportation Co.
1905, Mar 9 Owned A. Booth Packing Co., Duluth. 1906 New scotch boiler 13 x 121; 150# steam by Northwestern Boiler Works, Duluth, MN. 1909, May 29 Owned Booth Fisheries, Duluth. 1912, Dec Grounded Iroquois Reef, Thunder Bay. 1917, Jul 27 Owned James W. Elwell & Co., New York, NY. 1917, Aug 21 Owned French Government; renamed APACHE; patrol boat WWI. 1926 Owned Bacouche, Montefiore & Rinauro, Tunis, Italy; dismantled there.